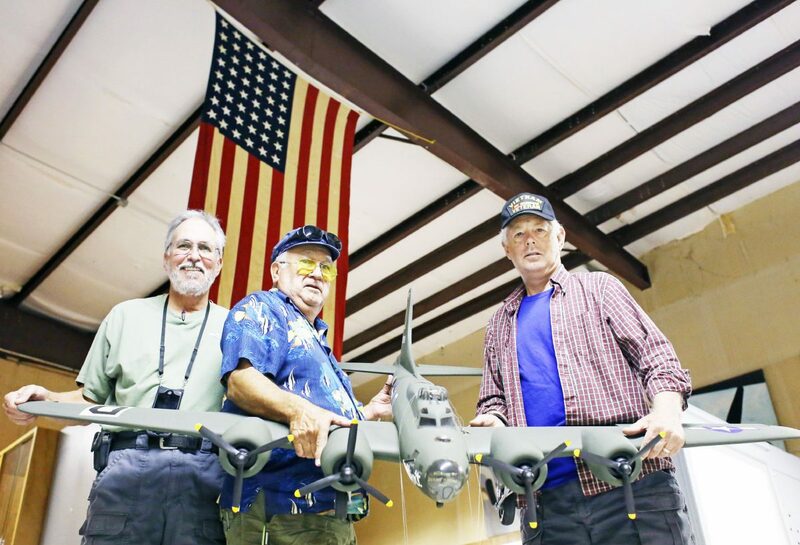 Commemorative Air Force Rio Grande Valley Wing Finance Officer David Hughston opens the door to the Commemorative Air Force (CAF) World War II aviation museum, which open in 1991 as CAF members look for a new location to house the iconic museum. A handful of volunteers are packing 26 years of accumulated stuff into boxes at the soon-to-be-former Commemorative Air Force headquarters and aviation museum at the Brownsville South Padre Island International Airport. The Rio Grande Valley Wing, established after the CAF pulled its headquarters out of Harlingen in 1991, has until Jan. 30 to clear out its fleet of vintage aircraft, vehicles, equipment and other items. The RGV Wing, which puts on Air Fiesta every year, was informed by airport management in September that the city would no longer be able to subsidize its hangar space and utilities. The CAF, whose mission is to preserve World War II-era “warbirds” in flying condition, got its start in 1957 at old Rebel Field in Mercedes when a small group of ex-service pilots pooled their money to buy a surplus P-51 Mustang fighter plane. Today headquartered in Dallas, CAF has 75 wings and squadrons, featuring hundreds of rare aircraft, around the United States. The RGV Wing is eyeing PortIsabel-CameronCountyAirport as a potential new home base. David Hughston, CAF’s finance officer and Air Fiesta chairman, said he hopes to negotiate a deal with the management of the Port Isabel airport for hangar space for the RGV Wing’s small fleet of aircraft. He said the long-term goal is to work with the county in building additional facilities at the airport to house the wing. Commemorative Air Force Rio Grande Valley Wing Finance Officer David Hughston left, Executive Officer Tom Santos and Museum Director David Christopher hold a model replica of a World War II Blivit B-17F 418th Bomb Squadron-100 Bomb Group Tuesday as the Commemorative Air Force (CAF) prepares to move their World War II aviation museum to a new location. 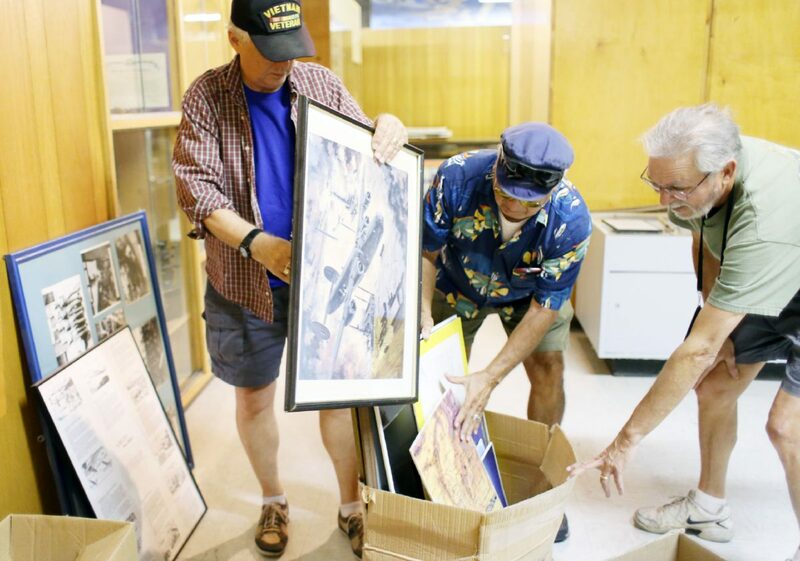 Commemorative Air Force Rio Grande Valley Wing members carefully place memorabilia as CAF prepare to move their World War II aviation museum to a new location. The Port Isabel airport was built during World War II as a U.S. Army Air Corps facility. After the war it served as a Naval Auxiliary Air Station until 1963, when it was deactivated and turned over to CameronCounty. Hughston said the wing plans to sell two of its non-flying aircraft, a Beechcraft Bonanza and a Ryan Navion, both of which were built after World War II, and sometime next year will disassemble the group’s Focke Wulf 44 “Stieglitz” and transport it to the CAF base in Dallas. The Stieglitz, a 1930s biplane designed in Germany, requires a total restoration, something the RGV Wing will never be able to afford, he said. 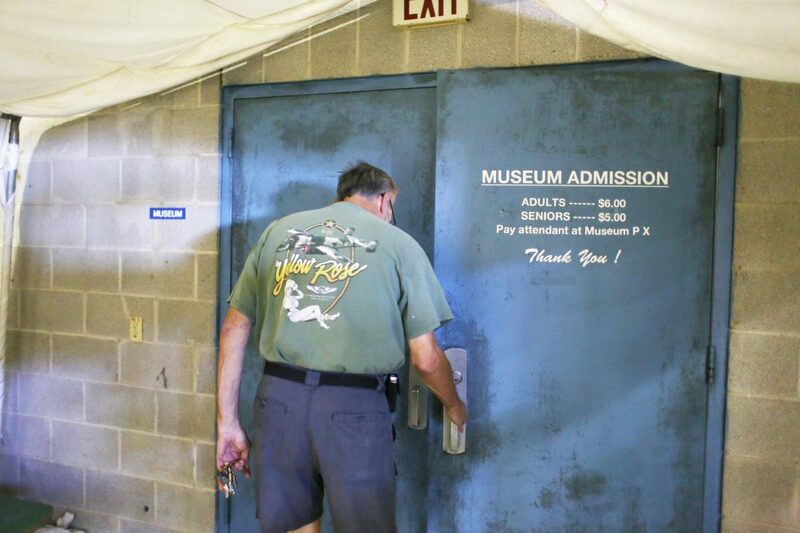 The museum is now closed to the public; volunteers are dismantling, cataloging and boxing up the museum displays; and shop tools and equipment are being organized and prepared for transport, Hughston said. The wing will hold a moving sale Nov. 4. The address is 955 Minnesota Ave.
Hughston said it’s hard to know exactly what the future holds, since everything is fluid at this point. The only thing certain is that the group will be out of the Brownsville airport as quickly as possible, he said. Still, Hughston insisted he’s optimistic about the future of the wing and Air Fiesta.